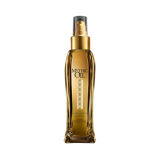 Indulge in the Ultimate Oil Ritual. Featuring in-salon and at-home products designed to balance the natural oil levels in the hair: cleansed at the root, nourished at the ends. 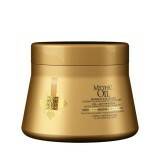 Inspired by oriental traditions, the Mythic Oil Original oil instantly and deeply nourishes t..
Gently cleanses hair with a blend of argan cottonseed oils, vitamin E and e..
• For Nourishment and Vitality • Contains Osmanthus and Ginger Oil ..
Revives tired tresses with a deep conditioning masque that replenishes hair..
For Nourishment and Vitality • Contains Osmanthus and Ginger Oil&n..
Great news for all L'Oréal Mythic Oil fans, especially those with coloured tresses. 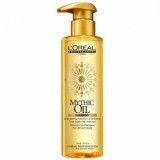 L'Oréal bring..
Nourishing & smoothing Multi-use cream HAIR TYPE All hair ..